The budgie is also known as the parakeet and it is easily one of the most popular pet birds. Not only are budgies generally easy to care for, but they are affordable, highly social, and they come in a brilliant array of colors. Keeping budgies is a little less work than keeping other birds, but it is still important that you provide for your budgie’s basic needs. Choosing the right bird cage is very important to keep your budgie happy and healthy. 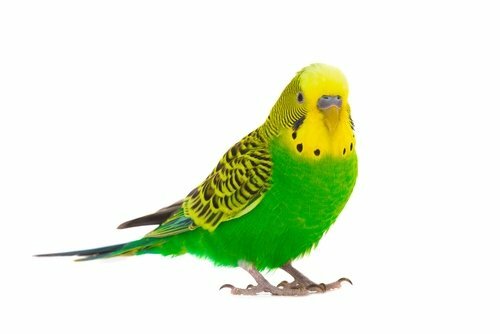 Keep reading to learn more about budgie care requirements and how to shop for the best bird cage for budgies. How Much Space Do Budgies Need? What Else Should You Include in Your Budgie Cage? The budgie is a small bird that stands between 6 and 7 inches long. These little birds live an average of up to 10 years, though they have been known to live longer in captivity. The best way to extend your budgie’s lifespan is to provide a healthy diet and a spacious cage. Though the budgie may be a small bird, they are very playful and active which means they need a significant amount of space. Unfortunately, because budgies are not very expensive, they are sometimes treated as a throw-away pet. Poor care, mistreatment, and neglect will only shorten the bird’s lifespan and increase its risk for health problems like obesity and malnutrition. When it comes to the budgie’s care requirements, a balanced diet and a spacious cage are at the top of the list. These birds need several perches as well as space to fly and toys for enrichment. Pet birds spend most of their lives in a cage, so it is important to make sure that the cage you choose meets your budgie’s requirements. 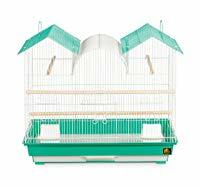 You’ll need to think about factors such as size, dimensions, and materials when shopping for a budgie cage. Minimum Cage Size – The minimum cage dimensions for a single Budgiesare 18×18 inches, and the minimum for a pair of Budgiesis 40x20x20 inches. Flocks need much larger cages. Width and Height – Budgiesmay not be large, but they are very active so they need a wide cage to permit flight and a high cage so they can have several perches to hop between. Bar Spacing – Because Budgiesare small, you should make sure the bar spacing in your cage is no more than ½ inch, so the bird doesn’t get its head stuck by accident. Perches – You’ll need at least two different perches in your Budgiescage, or more depending how many birds you keep. The perches should be different thicknesses and made from different materials to keep the bird’s feet strong and his nails filed down. Keep reading to see our top 5 recommendations for the best bird cages for budgies. Budgies are very active birds that require a lot of vertical and horizontal space as well as plenty of perches and toys for enrichment. 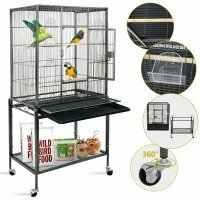 As long as you provide your budgies with enough space, you have some wiggle room when it comes to choosing a bird cage. Budgies are social birds, so if you want to keep a group of them, you’ll need a fairly large cage or a flight cage. 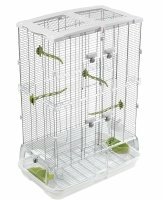 This Prevue Hendryx Pet Products Wrought Iron Flight cage is ideal for a group of several budgies. It is made from wrought iron to ensure durability and offers several features for convenience and easy cleaning. It has a pull-out metal tray, rolling wheels, and a shelf for storage. Plus, it comes in two sizes (large and x-large) but is affordably priced under $150. Budgies need a lot of space because they are very active and that’s exactly what this Super Deal Wrought Iron Bird Cage with Stand provides. This cage measures 53-inches long and is made from ultra-durable wrought iron materials to stand the test of time. It comes attached to a rolling metal stand with a wire shelf for storage and also comes with a slide-out tray for quick and easy cleaning. 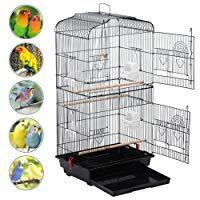 Overall, this bird cage provides just about everything you could want for your budgies including two perches. This spacious bird cage is a lightweight and portable option for budgies. Whether you’re looking for a travel cage or something big enough to accommodate more than one budgie, try this Yaheetech 36” Medium Portable Bird Cage. It is made with 2 large side-opening doors, each with a security latch. IT also comes with 2 hooks to secure the slide-out tray and it is very quick and easy to assemble. You’ll also be glad to know that it is affordably priced under $50. Bird cages can be expensive, but this Vision Medium Bird Cage is a great option. Not only is it priced under $75, but it is large enough to accommodate a pair of budgies. It is made from durable metal wire with less than ½-inch spacing for safety and includes four perches. The cage itself detaches from the plastic base for easy cleaning and features a debris guard that keeps waste from falling outside the cage. Budgies are small birds, so they don’t actually take up a lot of room, but they do need space to fly. If you’re looking for a simple and affordable everyday cage and plan to keep a separate flight cage for exercise, this Prevue Hendryx Triple Roof Bird Cage is a good option. It is made with a unique triple roof design to add a bit more vertical space for perches and has two full-length perches below. This cage has a removable bottom grill and pull-out tray for easy cleaning and it is lightweight overall and comes with two handles for hanging. Plus, it is priced under $65. Expert opinions vary except in the idea that more space is always better. If you do not give your budgies time outside of the cage, the size of their cage needs to be bigger than the minimum recommendation. For a single bird, you’ll need a minimum of 12x18x18 inches and, for a pair of birds, at least 39x20x32 inches. For a group of birds, you’ll need a great deal more space. In addition to your budgie cage, you’ll need to include certain things to provide for your budgie’s needs. Provide several perches your bird can hop between as well as a water dish and one food dish per bird. For enrichment, include a variety of chew toys and soft wood products your birds can chew on. Some budgies also enjoy bells and mirrors. It may seem like all bird cages are the same, but there are some key differences to keep an eye out for. When shopping for a budgie cage, keep the minimum dimension requirements in mind and buy the biggest cage you can afford. If you’re not sure where to start shopping for a budgie cage, try one of our top 5 picks reviewed above! wereallaboutpets.com is a participant in the Amazon Services LLC Associates Program, an affiliate advertising program designed to provide a means for sites to earn advertising fees by advertising and linking to Amazon.com.